Should you should join a travel writers association? Sometime after you decide to become a travel writer or travel blogger, you’ll begin to wonder about the groups that are out there. When I teach workshops and coach clients, they ask me for recommendations to reputable groups. 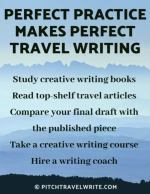 There are lots of travel writing associations out there and it’s difficult to know which ones can serve your particular needs. This article will help you decide whether or not to join a travel writers group. 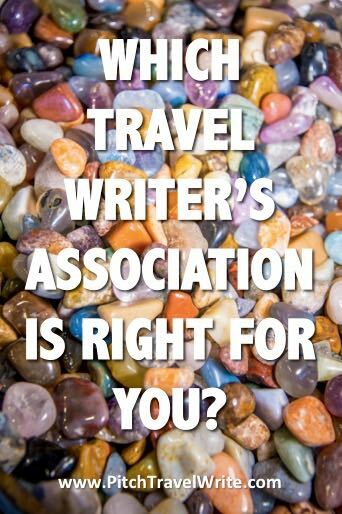 And if you decide to join one, this article will help you find just the right travel writers association for you. Why Join a Travel Writers Association? Over the past few years, while I was on press trips and Fam Tours—and at conferences—I asked my peers which groups they belonged to and whether they felt they were getting value from their membership fees. I talked to dozens of writers and bloggers at all levels of achievement—from novices with a few bylines to veteran writers with hundreds of bylines. What are the tangible benefits you received by belonging to an organization? What are the members like? Are they snobbish or down-to-earth? Beginners or veterans? Does their association host annual conferences? Are they for-profit or non-profit organizations? Does the association offer opportunities for meeting magazine editors and DMOs? Some travel journalists said they thoroughly enjoyed belonging to their travel writers association, and got a lot out of belonging. The “joiners” said they loved meeting other writers at conferences and group meetings. They also picked up plenty of good, actionable tips at conferences that they could implement to improve their travel writing. This group tends to be novice travel writers and bloggers. It makes sense. They have the most to gain from joining professional travel writing associations. With a steep learning curve, they are just beginning to lay down their networking foundation. Neophyte writers are still trying to figure out how to make contact with magazine editors and get their articles published. They want to know how to score those coveted press trips, and make contacts with DMO reps. They’re still learning how the “comp” system works, and they can learn this by attending workshops and conferences. Are there Travel Writers Associations for Loners? Other writers tended to be loners, typically veterans with some years of experience under their belt. They claimed that associations did not provide them with any benefits that they could not provide themselves, with a little due diligence. The “loners” told me that if you’re plugged in to the travel community through social media and read relevant newsletters, plus have a network of travel contacts (writers, editors, DMOs), you won’t need to join a group. Veteran travel journalists have pretty much got these things figured out. They have a group of editors that they work with regularly. They’ve also already established networks of Destination Marketing Organization (DMO) media reps. They know who to call for assistance with their travel assignments. Organizations for travel journalists aren’t for everyone. It's okay to go it alone if you already know the ropes. There are several groups with slick marketing who charge high membership fees, host conferences with little useful content, and provide little or no service for unwary beginning travel writers. 1. Is the group specifically for travel journalists? While there are several reputable associations for all kinds of writers, you’re better off joining a group that specifically caters to travel journalists and/or bloggers. Many writers groups are aimed at novelists. Although you might learn something about the craft of writing, this kind of group won’t help you much if your focus is travel. 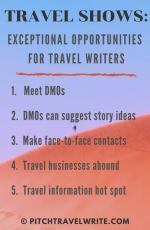 To get the most out of your membership, look for travel writing associations and groups specific to the travel industry. 2. Does this travel writers association provide good value for the money paid? Think about what value the travel writing association is providing for the money you must pay for membership. Does it seem worth it? Read their website copy very carefully before joining. Contact customer service if you have questions. Look at the benefits they can offer you - does it meet your requirements? Word of mouth referrals are often the best way to learn more about an organization. Ask other travel journalists about their experience with the organization that interests you. 3. 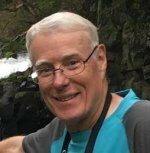 Do the travel writing association host “pay to play” competitions? A word of caution here - this is a red flag. Writing associations that charge their members entry fees to enter articles in award competitions should be regarded with skepticism. For example, I know of one association in North America that lavishly dishes out awards to their favorite sons and daughters year after year. High visibility travel journalists and bloggers who are in a position to further promote the association seem to consistently receive awards. Lesser-known, but equally talented, writers who submit articles never receive awards or recognition. Look for transparency in reporting competition statistics. • How many entries did they receive in each writing category? • Did a wide variety of people win the awards in past years? • Ask to see a list of award winners from previous years. If this information isn’t readily available, and/or the same names keep popping up year after year, be skeptical of the group! Associations that offer “pay-to-play” awards are often a complete waste of your hard-earned money. People who know the industry don’t regard these awards as credible honors. You might just as well arrange a direct deposit to their bank account and not waste your time submitting your travel stories. What’s the Right Travel Writing Association for You? Most travel journalist associations recycle the same information about press trips and Fam Tours from information that's publicly available: on social media, in newsletters, websites, and DMO sources. If you're willing to take some time to find it, you can track it down yourself. However, joining an organization may help you build your network faster and more reliably than doing it on your own if you’re new to the game. And there are many other benefits depending on what you need. Billing itself as the world’s largest travel writing association for professional travel journalists, ITWA provides key information in a no frills format for professionals who travel to write, broadcast or create images. I really like this group because, best of all, membership in ITWA is free! I’ve corresponded with its organizer a few times, a hard-working gentleman named Ashley Gibbons. He’s always been helpful and switched on. ITWA has added several avenues for writers and bloggers to post their travel stories and it provides outlets for beginners to display their handiwork. The Alliance works closely with representatives of the travel and tourism industries worldwide and with travel and tourism-related clients. It has links to 1,800 travel industry representatives and 1,200 PR agencies with travel related clients. ITWA offers a press card (for a fee), a syndication network, an opinion forum, an alliance bulletin, and you can have your travel stories published on their online website, Allways Traveller or in the new digital magazine, All Ways. This group does not yet host an annual conference. This worldwide community consists of locally organized get-togethers for travel bloggers, writers and tourism companies. I attended a meeting in Seattle and was impressed with the turnout and the sincerity of the attendees. And I made a few new friends. It was fun. This global travel writing association is a network for people involved in the hospitality and lifestyle fields and the people who promote them. This non-profit is run by and for the benefit of the members, and was founded in California in 1981. IFWTWA isn’t just for “foodies” and wine writers, though. Its members cover a broad spectrum of travel destination attractions such as active and passive adventure activities, ecology, historical features, culture, fairs, festivals and special events. This group also hosts conferences and 3-5 press trips each year, and distributes a monthly publication. IFWTWA membership standards require suitable URLs or clips from the past two years, or a book link with ISBN for regular journalists or photographers. They do accept bloggers who write on topic and have been blogging a minimum of six months with a good following. This group enforces a code of professional conduct and members must update their outlets every year when they renew their membership. I’ve met dozens of IFWTWA members and officers on my travels and they’re all on the level. They’re well published professionals, and they’re eager to welcome other writers. I have no hesitation recommending this group to my readers. SATW is a premier travel writers association. To become a member of SATW, you must produce evidence of a substantial portfolio. This rigid screening and application process guarantees they are no rank amateurs. SATW counts among its membership, newspaper writers, magazine travel editors and staff writers, travel website and blog owners, travel trade editors and staff writers, travel book editors and publishers, freelance travel journalists and photographers, and broadcaster/Video/Film Producers. They have a rigorous, objective, and clearly defined qualification process (based on byline circulation statistics or website AUVs) and a nomination from a current member. This ensures that SATW has highly credible and professional members. SATW also has a readily available Code of Ethics. Because of SATW’s stringent selection process, it does take a while (perhaps even several years) for applicants to round up enough quality bylines to make the cut. If there was ever an association that an American travel journalist should aspire to, this is the one. 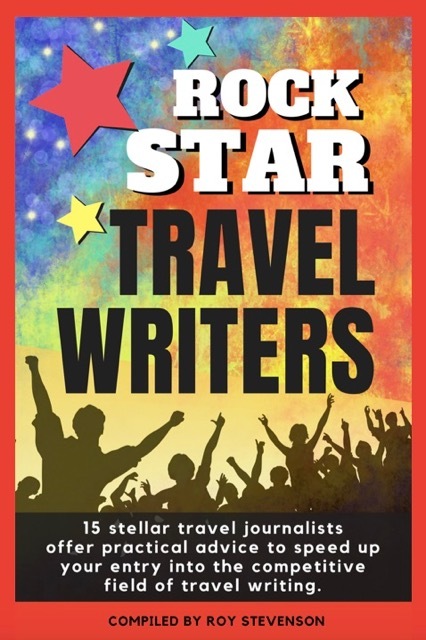 In my new book, Rock Star Travel Writers, you’ll learn the insider tips, tools, tactics and habits that leading travel journalists use to land assignments in the world’s most prized travel glossies. In this book you’ll hear about the nuts-and-bolts of successful travel writing. You’ll read about each writer’s personal journey into the freelancing world. And they’ll give you their best insights of how they’ve broken into the world’s most treasured travel publications. Will Social Media Help You Get Published?